It looks like my little friend, Mr. Cat has cashed in his chips. I saw him for a little bit last Thursday and not since. It was around 10 years ago when his mom brought him and his 2 baby brothers out to play out back here. When I'd see him he would hiss at me and he was so funny and cute I'd just laugh and he took to greeting me with a hiss just to say hello. I'd get him and 1 brother that hung around cans of cat food, and Mr. Cat, just a kitten would walk backwards, blocking me, hissing and mewing, trying to shake me down for his supper, as I would take the food to feed him. It was hilarious. If I didn't have the food with me, I'd have to go inside and get it and as an older cat, he would sit outside the door and hiss like a mountain lion, never meaning any harm. He was one of my best friends. Hopefully Mr. Cat will return. Perhaps he just needed some time somewhere else. Our ferals come & go, sometimes for days on end. I keep checking. This has been a while. Thanks. Cats are independent creatures. If he has not been neutered, it is possible that Mr. Cat is out looking to pitch some woo with a future Mrs. Cat. It is that time of year, you know. We will keep a good thought for Mr. Cat's return. I think he is gone. He looked like he was having some trouble with his teeth in recent times. They say that is usually what gets an older feral cat. Sorry for your loss, 75. That is one good-looking cat! It's mighty spooky though, that pic was from 40 feet away. Any closer and it's gone. We have a female cat who adopted us years ago. She only likes my wife. Cats are funny. I have tried every trick I know to bribe that cat where she will like me to no avail. Rub old fish on yourself and see what happens! I know that usually works with dogs. I think it's fun to watch the different personallities of cats and dogs. Wildcat445 wrote: We have a female cat who adopted us years ago. She only likes my wife. Cats are funny. I have tried every trick I know to bribe that cat where she will like me to no avail. Get a bag of those temptations things. I think they have them at big lots. They're about 1/4 inch square. That'll make you a special person in no time. Mr. Cat used to jump up and catch them in the dark under street lights when I would toss them to him. The cats love those things! We get them at WalMart and they are $8 for a 1lb. box! My friend Ruth has a cat that is just like that, and, I made it my friend in just a few seconds. I also find horses are much the same way..
Of course, it doesn't hurt to be holding a carrot in the other hand, either. Heh. I thought that only rabbits and, humans liked Carrots. My favorites are dogs but I will be good to cats as well. A few years ago while the state was forcing many of our neighbors to move there was a influx of stray cats. One reason I think was some folks left their cars or that they were strays that went to their houses. Being strays they may have been skiddish and would not be able to be caught easy. One elderly lady here had lots of cats and I suspect most were hers. She wound up going to the nursing home and never came back home. Her family wound up settling on a house for her in town she never got to live in. Anyway there was this one cat that took up with our place. My wife and her mom called it scarry cat since it would not get close to anyone. It would hang around close to our cats when I fed them and then come eat with them when I left. I noticed this and I would put a plate close to the area he was at and put food in it for him. After about a week it did not run off and I could stay in the area. Over a few weeks it got to where I could be putting food in the plate and he would come over. Each day I would attempt to win its trust more. Finally I was able to pet it after a month or so. Then after this I only saw it a couple of times more. The last time I saw it I put some scraps in the barn he stayed at. I have no idea what happened to him. 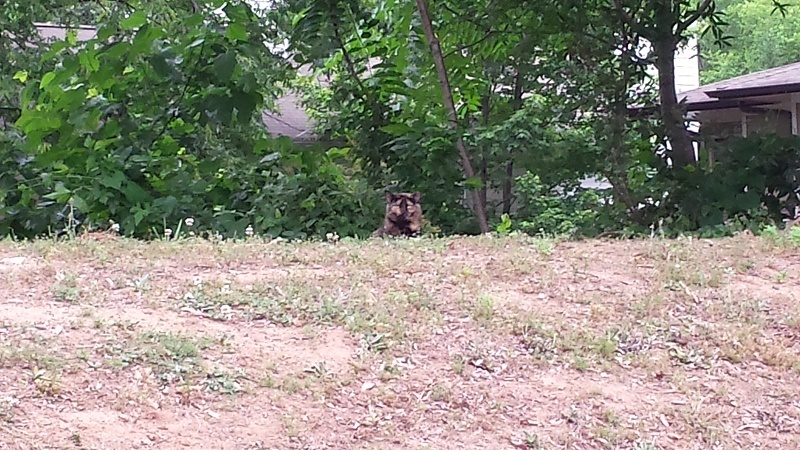 Around the same time of the state comming through buying houses a stray dog showed up. It was a small one and since our other dog died I though this would make a nice one. I never could get closer than 5 feet from it. It would growl at anyone. Its fur was matted up and someone had not taken care of it. I also wonder if someone abused it and then dropped it in my area which happens a lot. The last outside dogs I have had have been strays or products of strays in this area. Anyway one day I saw this small dog in the road and it had been hit. It seemed like a sad dog and had never known anyone to care for it. We had an elderly lady in our community who had feral cats. When she passed, several of the neighbors got together and set out live traps. We caught the cats and took them in to the free vet clinic and had them spayed and neutered. Our feral problem came to an end. Most all of them got tamed and adopted. Wildcat445 wrote: We had an elderly lady in our community who had feral cats. When she passed, several of the neighbors got together and set out live traps. We caught the cats and took them in to the free vet clinic and had them spayed and neutered. Our feral problem came to an end. Most all of them got tamed and adopted. Around here feral cats don't last long. We have been over run with coyotes in the last few years. The tame ones we have and others seem to be smart enough to go to the barns overnight. 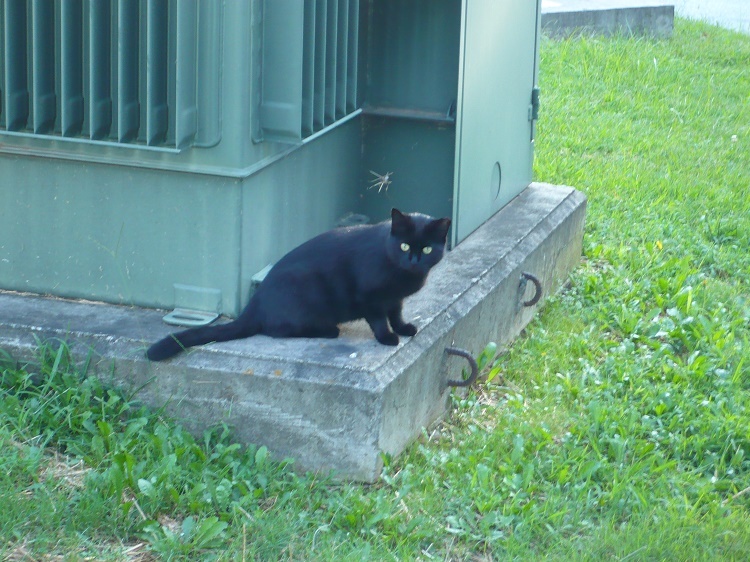 I went out for my walk this evening and Mr. Cat was laying on the generator stand where i usually feed him. He is skinny as a rail. He must've been ill, or something. He really looks poorly. I gave him my supper as I didn't have anything else for him. I hope he is able to show up tomorrow. 75X11 wrote: I went out for my walk this evening and Mr. Cat was laying on the generator stand where i usually feed him. He is skinny as a rail. He must've been ill, or something. He really looks poorly. I gave him my supper as I didn't have anything else for him. I hope he is able to show up tomorrow. We have had a few cats like that. Has he been neutered? Some of the male cats we have had left for a while to find a mate then come back later. When we had them neutered they never left. Yes, he was neutered when he was 3. They had a program where they would catch cats and neuter them then they would snip off the tip of their drivers side ear.